In today's Windows environment, end users are accustomed to having local administrator privileges which allow them to download a variety of applications and potentially misconfigure their PCs. While standard wisdom may be to simply solve the problem by revoking local administrator rights on users' systems, the reality is that this may not be an option at all organizations. 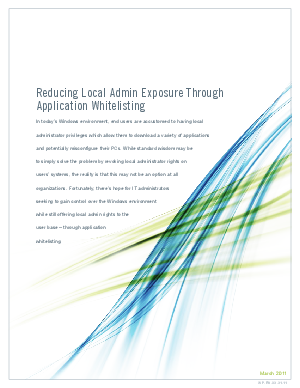 Fortunately, there's hope for IT administrators seeking to gain control over the Windows environment while still offering local admin rights to the user base - through application whitelisting.